Opera Beta 47 not accepting Opera password as passohrase. I have Opera Beta 47.0.248.128830 on a Motorloa E2 LTE XT1526 running Lineage OS 14.1 (Android 7.1.2). Data savings is disabled and ad blocking is enabled. When I open settings it says I'm "Signed in" but also shows an exclamation point in a red triangle. When I click the triangle, it says "Passphrase required" and when I click that it says "Enter your Opera account password to continue". I enter my password and it says it's invalid even though it's the same password I used to sign into the Opera browser. Why does it ask for but not accept my Opera account password, the only password I've set up with Opera? I'm guessing it wants a separate passphrase but it doesn't say so and it doesn't offer me any way to set one up. @yeswap Thanks for raising your concern. Could you please confirm that you are able to sign into Opera Desktop using same username and password? If you sign in using any social login (like Google/fb/twitter/vk) it should ask you to enter a password (if you have already set one) but if you never created any password then it will redirect you to create a new passphrase to enable sync for social login. @neetesha I don't normally use Opera Desktop but I just tried it and I'm able to log into Opera Desktop using my Opera ID (yeswap) and password. I'm not prompted to create a passphrase and I don't see any option to create one either. I don't use social sign in and I've never had an Opera passphrase, only a password. 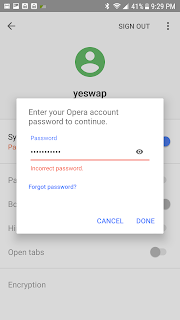 How am I supposed to create this passphrase which is apparently new to Android Opera 47?. @yeswap This seems bit odd. Could you please share some screenshots in order to understand the problem? Please share the screenshot of screen which is shown after trying to enable sync. @neetesha I won't have access to device capable of running Opera desktop for about a week. I've attached screenshots show the sync settings on Opera Mobile. I entered my correct Opera account password as prompted. Same problem. Have reset password twice and still says incorrect password. I figured the servers may have needed more time to update but it has been over an hour now since last reset. I'm currently traveling so I don't have access to my desktop. Same problem. After sigh in Opera require to enter paraphrase. I dont have it. Trying entering password 2nd time and says that it's wrong. But it's right. Now I don't have any sync. It does not recognize the password. Email assistance has stopped responding, what should I do? @yeswap @rvega89 @annelo @julijarrr @LorenWard @merineo We have fixed this issue in our latest beta version (47.0.2249.129321). Please confirm that the issue is gone for you. Alarm us if you still see the problem. Thank you, though how do I update to this version? The Google play store is not showing an update available and I don't see an option to become a beta tester on the page. @LorenWard "Opera Browser Beta" is a separate app and this issue was reported by a beta user. If you are using "Opera Browser: Fast and Secure" then you have to wait a little more to get update. Ah okay, my mistake. I am having this issue in the official release version then I'll give the beta a try. Thank you. Tried the beta version. It let me log in, the Sync slider ticked over to on, then immediately back to off, followed by a popup asking for my passphrase. My password did not work, problem persists. @LorenWard Thanks for trying. So you are getting this problem when you do following action? Providing correct password says "incorrect password"
Please confirm if above mentioned is happening also please confirm that the same account can login to "sync.opera.com"
Confirmed. I signed out of sync.opera.com and signed back in successfully with the password. I can provide a debug report if you want and can send me some instructions. @neetesha I've updated to 47.0.2249.129321. Opera Beta is still not accepting my Opera account password as the passphrase. I can log into sync.opera.com with that password. Opening Opera desktop and choosing Settings > Advanced synchronization settings > Reset synchronization. I logged back into Opera desktop with the same username and password as before. Then I logged into Opera Beta for Android and the "Passphrase needed" error was gone. 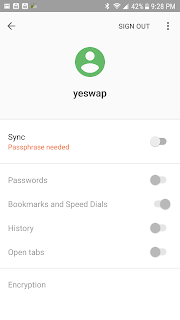 It seems like the Reset synchronization option needs to be added to Opera Beta for Android to allow Android users to fix this issue without having to have a PC or Opera desktop.